Powis Castle is an impressive stone keep and bailey fortress, which was originally founded, in the early 13th century by Welsh princes. Built along a ridge it is now mostly Edwardian in date, with a large twin-towered gatehouse, hall block and a square keep encasing a small inner courtyard. One side of the outer bailey still retains a range of buildings and a high curtain wall, flanked by half-round towers. A mile north-east in Welshpool is Domen Gastell and 7 miles south is Montgomery Castle. 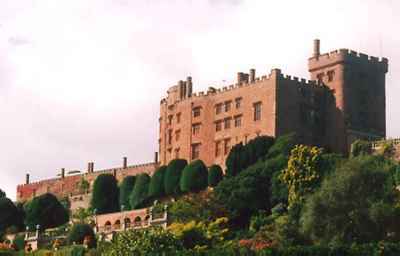 Powis Castle is located south of Welshpool, off Red Lane. 20 miles west of Shrewsbury, on the A458-A490. The site is owned by The National Trust and is open daily, April to September 12:00-5:00pm, March, October to December 12:00-4:00pm.